1759: Born January 2,1759 in NC to Benjamin and Rebecca Will Brimer. Twin to Jesse Brimer. In July 1777, when 18, Pvt. William Brimer volunteered to fight in the American Revolution with the NC militia out of Wilkes County, NC, where he then lived, in a campaign under Capt. Jacob Free (Col. Armstrong's regiment; General Rutherford's brigade) against the Cherokees in the valley towns. 1778, 2nd Volunteer Duty: In July 1778, he volunteered a second time in Wilkes County, NC under Capt. William Gilbreath (Colonel Buvard's regiment, General Rutherford's brigade) and marched to Moncks Corner SC which is near to Charleston SC to engage the British in Savannah, GA area. Pvt. Brimer was discharged from this tour of duty on 9 April 1779. 1780, 3rd Volunteer Duty: In Sept. 1780 he volunteered yet again under Capt. Valentine Sevier (Col. John Sevier's regiment) in Washington County, NC (which is now part of TN). Fought as an "Overmountain Men" volunteer militia battle group in the famous October 1780 Battle of Kings Mountain (see Donna Cator's Mills/Redden line also). Again he served as a private. The Battle of Kings Mountain was a major victory for the patriots. "William became part of Colonel Sevier's 240 man force" which joined other troops to pursue forces of British Lt. Col. Ferguson. Then he became a part of a 910 man battle force joining with 460 men from other units to become a 1370 force called "Avenging Horde" that caught and decimated the British at the Battle of Kings Mountain on October 7, 1780. This was an important battle in turning the tide in favor of American independence. before their trek over the mountains and down to the Cow Pens area. process, and taking prisoner both English soldiers and Tory sympathizers. Militia Service in Revolutionary War: Total of 14 to 15 months. 1784: Moved to Washington County, TN and married Elizabeth Elgin there It is possible that she is 1/2 Cherokee Indian. 1785: Moved to Rutherford County NC. 1790: Listed in Rutherford County NC 1790 Census records. 1795: OUR LINE: William and Elizabeth's son William S. Brimer, Hans' ggrandson, born. Note: Son William Brimer has a middle initial of "S" while the father did not. 1810: William Brimer and family moved to Sevierville / Sevier County / Jefferson county area. Brimer owned property on the south side of the large French Broad River. Likely called "going to town" as being Sevierville because there was no river to cross to get to Sevierville. He had one tax record in Sevier county; thereafter his property was actually just inside the county line of Jefferson County because the county boundaries were redrawn. 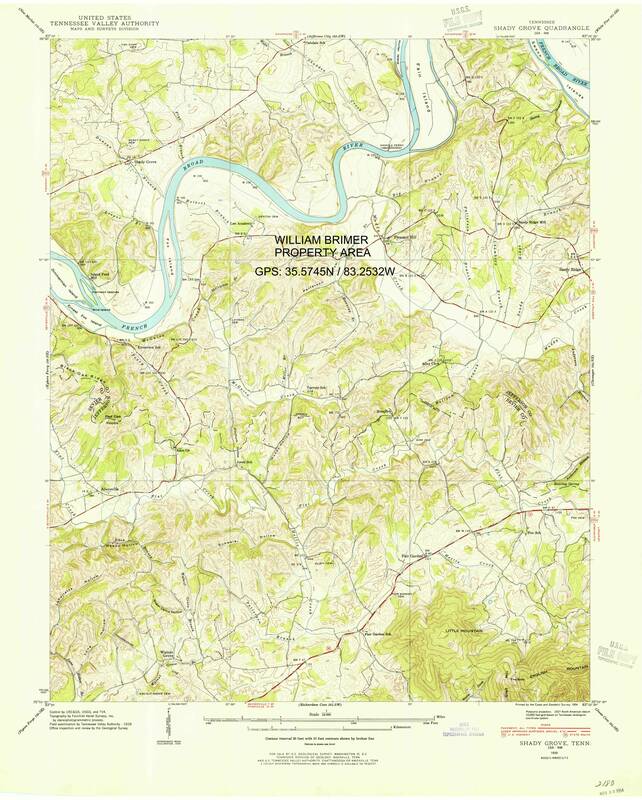 All the rest of his tax records were for Jefferson County which had as it county seat Dandridge, across the river! 1811 - 1824: William Brimer purchased several pieces of property on the south side of the French Broad River in Jefferson County between 1811 and 1824, beginning with one 121 acre property in 1811, then one 85.75 acre property in 1812, one 50 acre property in Jefferson County in 1824, and finally one 100 acre piece in 1825, for a total of approximately 386.75 acres. 1807 map that highlights the general area of William's properties in a yellow oval:. 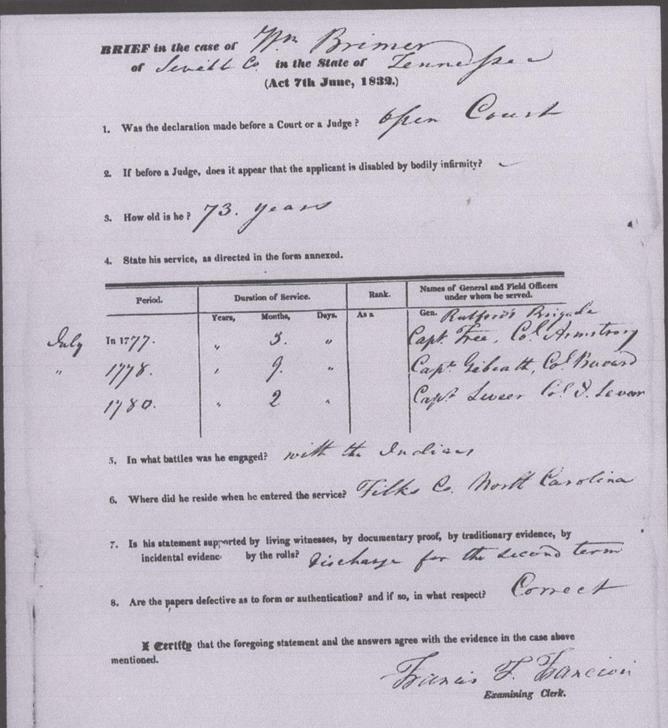 1832 July 27: William Brimer applied for a revolutionary war pension in 1834. His affidavit stated his age as 73 years and that he volunteered July 1777 while living in Wilkes County, NC under Captain Jacob Free (Colonel Armstrong's regiment, General Rutherford's brigade); in July 1778 he volunteered again in Wilkes County, NC under Captain William Gilbreath (Colonel Buvard's regiment, General Rutherford's brigade); Sep 1780, volunteered again in W ashington County, NC [at time of affadavit had become TN], under Captain Valentine Sevier (Colonel John Sevier's regiment); fought at Battle of King's Mountain under Captain Sevier in General William Campbell's command; fought in total between 14 and 15 months. 1833 Feb 11: Pension records awarded and indicate William Brimer received a total of $139.98 as of February 11 1833. 1834 Following William's Death: William's heirs gathered together to re-divide and then sell portions of his property to one another. The "deeds," which sold property to both John and Vineyard, list all of William's children and the spouses of William's female children. Personal Observation of Mike Brimer: After William's death, 2 of the children wanted to stay local and farm his land, so parts were sold to each of them. In the meantime, some of his children moved away a bit. His widow Elizabeth was having financial difficulties, appealed for a widow's pension, and got it. Link to Transcribed Deeds HERE. The linked pdf is a recent transcription of very early handwritten copies of the deeds, which may be available on this site in the future. These documents provide proof of family members. 1835: The 1835 TN Pension Roll shows William awarded for his duty as a NC Militia private, in the annual sum of $46.66 at age 75. "The records also indicate that he had received a total of $139.98 as of February 11 1833." His descendants are eligible for membership in patriotic organizations because of his service record. 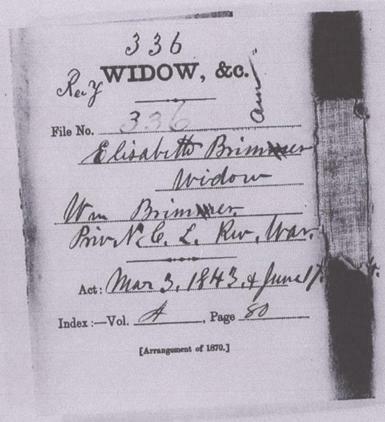 1839: March 4 affidavit of Elizabeth Brimer states she is 75 years old and a widow. 1840 June 16: Application for Pension filed by Elizabeth Brimer. She is unable to read/write so she signed her X before an acting Justice of the Peace in Sevier County, TN. In this application she states that she "became acquainted with" and lived with William Brimer as "husband and wife" in1785. In 1840 she was a widow. 1843: Elizabeth is granted an annual widow's pension of $20.50 as of March 4, 1843. Updated/corrected Thanks to Frank Anderson! Mike Brimer: I took this picture at ground level in the middle of "The Cowpens" area near Kings Mountain. This area was called the Cowpens because during that time farmers moved their cows to market and would temporarily keep them in this particular clearing because it was not only clear for grazing, but also completely surrounded by dense forest growth, acting as somewhat as a fence to keep the cows in. The Cowpens made for a perfect temporary campground and staging area for the Overmountain Men before sneaking on to Kings Mountain to surround and destroy the unsuspecting British force in October, 1780. Three months later, in January 1781, this same area was the site of the stunning victorious Cowpens battle. That was when Militias from 6 different areas under the command of COL Daniel Morgan were being chased by the dastardly Tarleton. Morgan led his group to the Cowpens open area, turned them around, deployed them and readied them to fight the oncoming British. The British fell into Morgan's trap and were crushed. Tarleton was last seen riding quickly away with several of his officers, leaving his men to their fate.